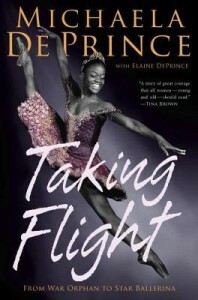 “Taking Flight: From War Orphan to Star Ballerina” (Knopf 2014) by Michaela DePrince is a memoir co-written with her adoptive mother Elaine DePrince. The degree of hardship that Mabinty, one of so many war orphans, endures, is difficult for a white middle class American, such as myself, to fathom. First her father is gunned down in the diamond mines where he works. So Mabinty and her mother become part of her uncle’s family. When her mother takes ill, rather than getting care for her, the uncle lets her die. He prefers his other wives. The uncle walks Mabinty to an orphanage where she befriends a girl with her same given name Mabinty Suma. They are orphans Number 27 and 26. The other orphans and her caretaker, Fatima, consider her ugly due to her spots, and she becomes known as the “devil child.” Eventually she wins over the orphans but not Fatima. Fortunately the head of the orphanage observes Mabinty’s intelligence. Mabinty finds the cover of Dance Magazine blowing in the dust. She is smitten by the white ballerina dressed in pink and en pointe photographed on the page. White American parents come to adopt the other Mabinty and at the eleventh hour take Mabinty Bangura as well. There couldn’t be a better family for these 6 year old girls. In the next years the adoptive parents will have lost their second of four grown sons to a congenital disease. They rename the girls Michaela and Mia and adopt more orphaned girls from Sierra Leone. The parents take the girls to ballet classes, piano lessons, swimming lessons. They are hard-working girls and they excel. But Michaela’s passion remains ballet. She works her way up the ranks from regional to nationally know training centers including that of the American Ballet Theater. She wins scholarships. A documentary “First Position” tells part of her remarkable story and can be streamed at http://www.balletdocumentary.com/ Eventually Michaela dances with the Dance Theater of Harlem, the famed black company, but she wants a purely classical experience which DTH doesn’t offer. Michaela speaks of the racism of the ballet world. A black pearl stands out in a string of white pearls, but she has found herself a place in the Dutch National Ballet in Amsterdam, which is a purely classical ballet company. Michaela’s is a simple story: young girl suffers extreme hardship and succeeds. Neither the plot nor the writing is remarkable. And yet the story is. To become a dancer requires huge determination. To become a prima ballerina in a top-notch company requires the height of rigor, talent, and artistry. Consider where Michaela/Mabinty started and where she’s gotten. I’m betting this will be a best-seller.